GEOSET » Essential Language Skills for Adolescent Literacy: Have We Persuaded You? 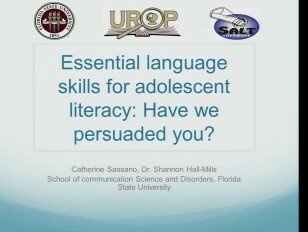 View Essential Language Skills for Adolescent Literacy: Have We Persuaded You? Through the FSU School of Communication Sciences & Disorders, Catherine Sassano investigates what it means for students in Florida to not pass the persuasive writing portion of the FCAT. Catherine takes an analytic approach to see how standardized testing differentiates good readers from poor readers and presents her findings.